Hey Erin, that from the toead in the hole , it is true! I am from Belgium, as you know & I read delicious & Olive magazine & have recipes like that. This bread looks so lovely!! I love quail eggs! Yummie combination! I was wondering...do you buy your goetta from a local butcher? I looked at Kroger the other day and noticed MSG in Gliers. I am hoping I can find a local butcher who doesn't add the unnecessary yucky ingredient! If you have a butcher you would reccomend that would be great. Thanks! The best bets for the best quality goetta that is minimally processed is from a couple of butchers at Findlay Market. My personal favorite is Eckerlins. Another great one is made by Kroeger Brothers. 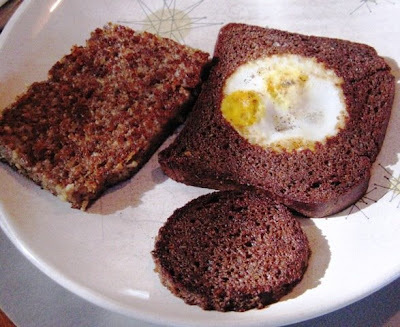 Sorry, but Toad In The Hole is sausages baked in Yorkshire pudding Batter, what you have there is Eggs In A Basket.